The Philippines is one of the most spectacular destinations in the world with incredible islands, tasty food, friendly locals and lots of things to do. If you would like to travel to the Philippines there are so many places of interest to visit, from ancient rice fields to some of the best beaches in the world. If you would like to travel, go backpacking, take a gap year or volunteer in the Philippines you can find more information on our guide which includes information, tips, itineraries and inspiration. Several airlines offer international flights to different areas of the Philippines, book in advance to get the best deals. Most international flights arrive into the capital Manila. The Philippines is a year round destination and there is no best time to visit. 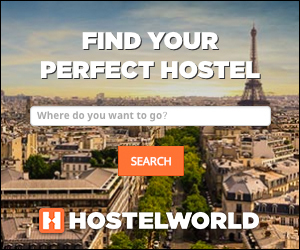 Thinking about going travelling or backpacking in the Philippines? Great decision! When looking to travel in South-East Asia a lot of people don't add the Philippines to their itinerary but believe us you will be missing out if you don't go. 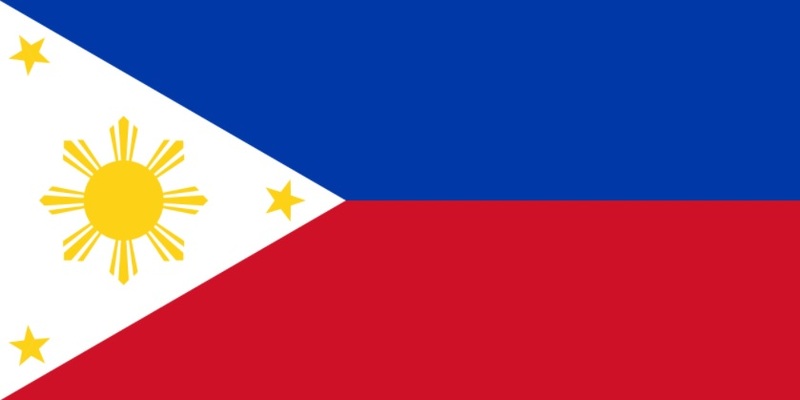 The Philippines is a spectacular country full of treasures, be it its tropical and diverse landscapes and beaches, its mixture of cultures or its actual, well, treasures (with hips of sunken Spanish galleons and the still undiscovered spoils of war of the Japanese Imperial army during WW2!). You will love exploring this stunning country. From touch down in the Philippines you are greeted with the sound of hundreds of people, busy hustling and bustling as they rush to meet their loved ones and no matter what time of day be prepared for the humidity to hit you, almost as a little reminder that you are now in a truly tropical location. Like a lot of big Asian countries, the Philippines is very busy, jeepneys beeping their horns, tri-cades, motorcycles, taxis and people literally on every street corner, but don’t let this put you off, instead embrace it and get ready for the most unique and rewarding experiences of your life. In Cebu you can take a trip down to the famous Larsian BBQ area right off the main roundabout in the centre of the city one evening, we can only describe it as a big tent full of copious BBQ stalls all striving for your business, fish, pork, squid and much much more accompanied by puso (Cebuano rice wrapped in banana/coconut leaves) all at a very cheap price. The great local food and atmosphere is amazing if you are feeling adventurous! Whilst whizzing around you are more than likely to come across the famous lechon baboy of Cebu (spit roasted pig) this is pretty much a right of passage whilst in Cebu. You may also hear cries in the night of ‘Balut... balut...’ We’ll leave you to google this one, it’s only for the brave. If you want something a bit closer to home, maybe try Jollibee (very famous fast-food restaurant in Philippines) they do a great burger that’s for sure. If you like to shop there are plenty of shopping centres in Cebu, Ayala and SM being the biggest, if you want something a bit more traditional head to the Colon area, the oldest street in Cebu, little markets if you want local souvenirs, though do be wary of pickpockets in this area as it is extremely busy. Taxi is probably the best way to get around the city but don’t worry, they are cheap! Moving away from the city, Kawasan falls is a must see, picturesque waterfalls not too far from the city. If you are into scuba diving, Moalboal on the west side of the island is a must go, known as one of the best diving spots in the world, only about a 2/3 drive. 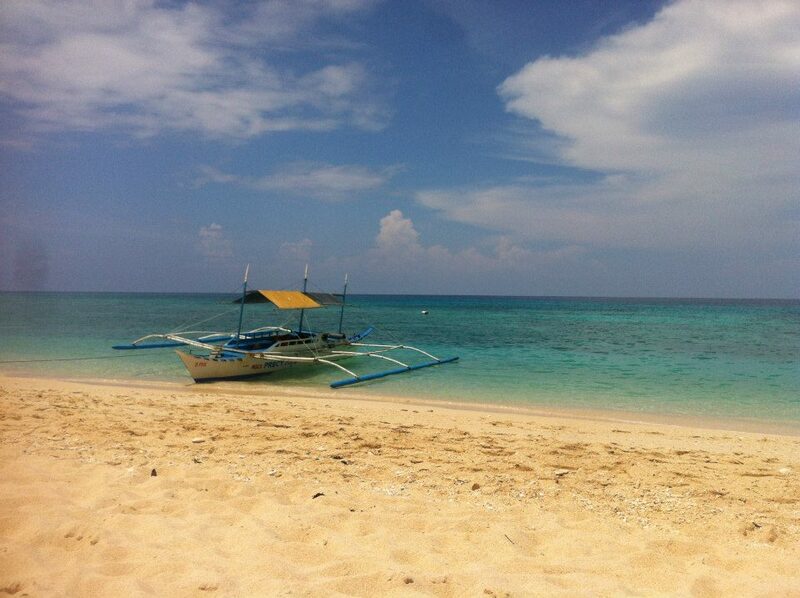 Then of course head back to Mactan Island for the most beautiful, postcard finish beaches. There are plenty of resorts here so take your pick, ‘Bluewater’, ‘Costa Bella’, ‘White Sands’ are a few of the places we recommend. Whilst on the way, definitely stop off and check out the Lapu-Lapu monument, the hero of the Mactan who was the first native to resist the Spanish colonization. A few things we would suggest here definitely check out Rizal (sometimes known as Luneta) Park, this seems the heart of the city, a charming park with the monument to another Filipino hero Jose Rizal. Come at night to see a spectacular light show across the water feature in the centre. Always a great atmosphere, lots of people, food stalls, fun fair rides and music. Makati is the celebrity/business hub of Manila, if you like to shop, drink coffee and enjoy good nightlife, this is your spot. Manila is also home to the Mall of Asia, this place is massive and the 3rd biggest in Asia (second only to 2 in China). Manila's Chinatown is one of the busiest, dirtiest, poorest and consequently most interesting neighborhoods of the country's capital. Chinatown is a feast for the eyes once again and a short and intense introduction to a world extremely different to the one you might be used to back home or from the hotel you might be staying in. If you want to get out of the city, take a trip to the nearest volcano, Taal. It does take a short boat ride and then a horse ride up a dusty steep mountain until you arrive at the magnificent Taal volcano, trust us it’s worth it. If you like to party, Boracay is your place! Once voted the most beautiful beach in the world, Boracay’s White Beach is among the best your eyes will ever witness. During the day the place is riddled with water sports and restaurants that appear on the beach, serving the freshest, cheapest and most delicious seafood (oysters, lobster, you name it) you could ever hope to experience. Once night time appears watch the tables and chairs gradually abscond as the place becomes a hub for night life. The glorious thing about this place is its versatility along the main strip. Once minute you will be in a full out nightclub, take a few steps along the strip and you will be listening to an acoustic act perform in front of an audience that is lazing around on bean bags on the beach whilst drinking at a small candle lit table. 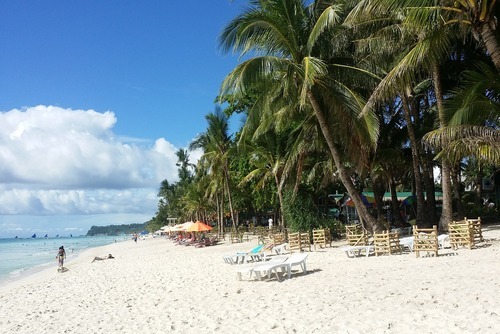 Whether you want to relax or dance the night away you will find it here in Boracay. Located a short ferry ride off Cebu’s south east coast Bohol is one of Philippines little gems. 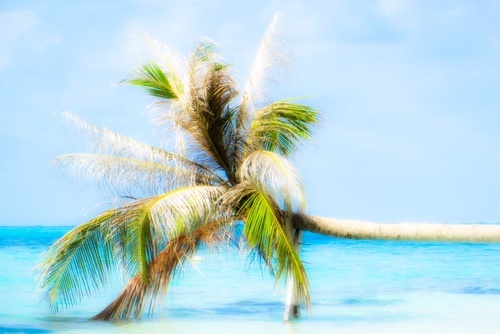 Sand so white it actually hurts your eyes, sea so blue you can’t resist jumping in, palm trees swaying in the tropical breeze and the best bit is, the beaches here are almost always deserted. Bohol has a famous tourist trail that I’d highly recommend once you’ve pulled yourself away from the divine beaches. There are tours which include visiting the famous chocolate hills, a wonderful buffet meal on a boat cruise and a trip to see the most famous residents, the tarsiers! 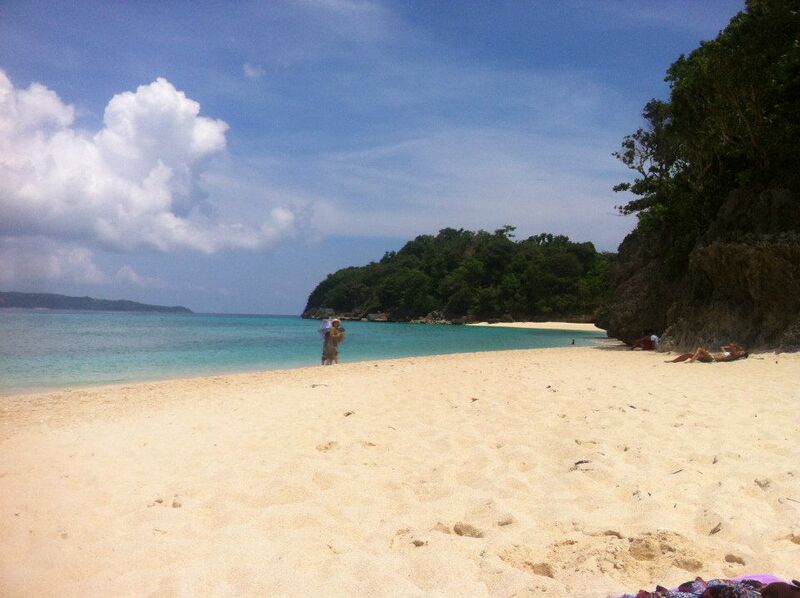 If you really want to get away from it all, and we mean REALLY get away, go to Palawan. Located on the west side of the Philippines it cuddles the Chinese sea, making the water wonderfully warm. Landing in Puerto Princesa, we took a car journey along roads that looked as if they had abandoned for years to the idyllic Port Barton. We recommend staying in Villa Margurita, a private villa surrounded by a couple of hostel style places on a deserted beach. Just beautiful, if you want to lay on a hammock and just watch the sea, come here, you couldn’t feel further from the ‘real world’. A visit to Vigan is recommended, this is the best preserved Spanish colonial city in Asia (and inscribed on the UNESCO World Heritage List). Vigan is quite a small place and you can easily find a local guide. There are horse carriage excursions where you can see a lot more and even a zoo where you can see tigers. The Rice Terraces in the Center of North Luzon (also on the UNESCO World Heritage List) are also a must visit if you are looking to see the real Philippines. The One hundred Islands National Park is amazing to visit even though it is not really recommended by the seen-it-all guide books. But it is really worth a trip in fact, especially during the off-peak season except for a few Korean tourists, you will likely not meet many tourists. You can also rent a boat for the day which can be fun, its also cheap if you get someone to help you haggle. The Park is made of 129 islands and you can hop by boat from one island to the next. The One Hundred Islands National Park is quite a drive to get there and you might need to stop off on the way, sometimes finding cheap accommodation can be difficult. From The One Hundred Islands National Park you might want to travel to Banaue via Solano. You can do this journey by public buses. Banaue is built among ancient rice terraces and is the only city "easily" accessible by bus in this great area of the Philippines. From there you have to walk to see the other rice terraces, the rice terraces of the village Batad is probably the nicest and are advised to check out. Solano is certainly not a touristy town, but you will managed to find a confortable hotel with warm water if you walk around. There are also lots of bars with live music... and lots of ladyboys. When you arrive in Banaue, you will be greeted with the impressive sight of the city. Quite an amazing place really! Batad's rice terraces are still hours away but worth the journey and effort in getting there. You might need help to get there, try to travel in the low season as there are lots of buses and services are less busy. You can hire bikes or get driven, then walk the rest of the way until Batad's junction. 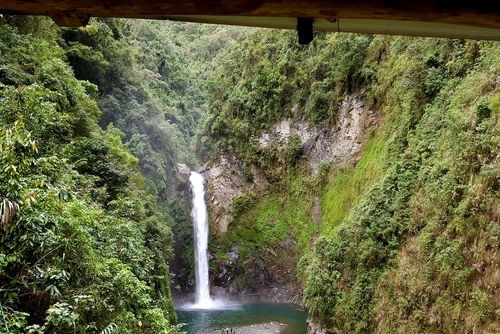 Here you can get a local guide who will take you to batad's rice terraces and an impressive waterfall. This can be quite an exhausting experience but if you are looking to get off the beaten track then you will love the highly gratifying hikes here. 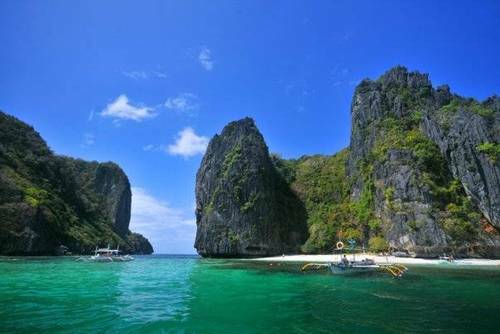 The Philippines is a great value destination especilly compared to other destinations in Asia like Thailand and Japan. Make sure you try to book accommodation in advance to secure the best deals. The cheapest way to get around the country is one public transport, although not the most comfortable method it will save you a lot of money. 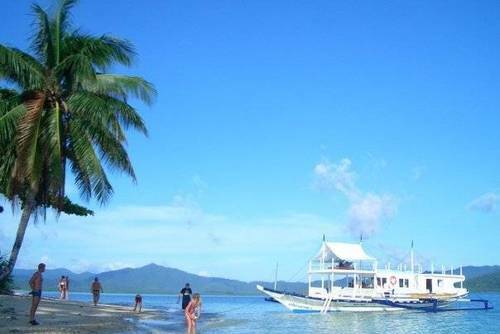 One of the most popular ways to explore the Philippines is on an island hopping adventure tour. 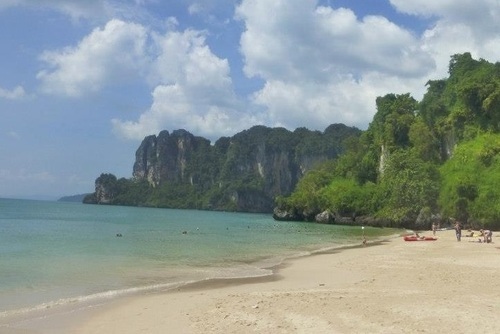 You will get to see spectacular locations, meet friendly locals and relax on stunning white sandy beaches. There are so many tours available for all budgets, whether you want to go overland or island hopping we have a selection of trips available to book all year round. On most tours you will travel overland in a private small tour van or via boat. For day trips and excursions sometimes you will use public transport and sometimes use internal flights to allow you to see the highlights as quick as possible. Typical group sizes are around 10-18 travellers with an average of 12 but this can vary between the tour and operator. We have a selection of tours for all budgets, so whether you are looking to explore on the cheap or you have a bit more money to spend you will be able to find a trip to match your interests. Our website features lots of cheap tours allowing you to discover the highlights of the country and not break the bank. Trips are perfect if you are travelling solo and would like to meet other people and travel in a group. You will get to meet other international travellers and get taken to the best locations in the country with an experienced guide. The price you pay really depends on the tour, company and duration. You acn search our featured tours above and enquire or book today. 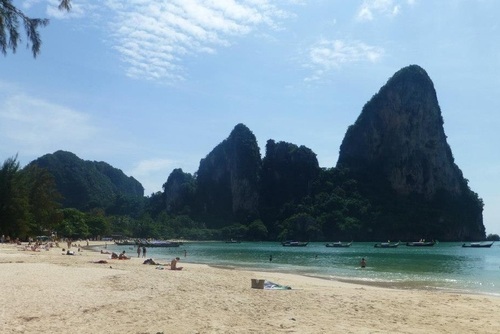 What is usually included is all transfers, accommodation, selected meals, activities, transport by private mini-van or boat and a professional English-speaking guide. If you are planning your gap year and are considering visiting the Phillipines we have some amazing travel opportunities which will appeal to you. Search our trips today. Participating will open your eyes to a different side to the country where you will get to interact and help local people unlike your normal beach break. This country has a vibrant culture and you will get to sample the local food whilst also visiting places most tourists don't get to see - this will be an authentic experience far away from the beach resorts. 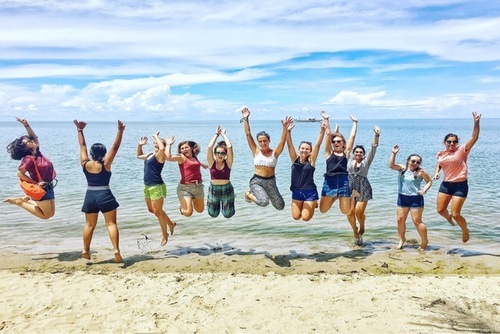 The Philippines is a very cheap destination to live and volunteer, the prices for getting around, eating and sleeping is very cheap compared to other destinations in South-East Asia like going to volunteer in Thailand. One of the biggest costs you will find is actually flying into the country due to the isolated positioning. Most local people speak English and so communicating shouldn't be a problem during your time here. There will also be lots of time to see more of this spectacular country in your free time. If you are looking for a rewarding holiday or gap year you might want to apply to join communitiy or environmental based initiatives. There are lots of community based projects in Cebu but most medical and educational programs can be joined on the island of Leyte in the capital Tacloban City. You can also join placements in the capital - Manilla. Most people who visit the Philippines fly direct to Manila and if you think Cebu and other parts of the country are busy, times that by 100 and Manila is what you get. You can also find volunteer work in places like Bohol, Boracay and Palawan. When you think of the Philippines you probably think about a tropical paradise and a popular tourist destination, but the reality is quite different for people living away from the tourist resorts. There have been several economic, social and natural disasters which have badly affected the country in the past decade. This country has a population of around 95,000,000 people but shockingly around 30% of these live below the poverty line. There are lots of NGO's, non profit and also international charities which operate on the ground in the Philippines which help people on the ground through funding and action. They aim to alleviate poverty and provide a better future for people with better education and living conditions. You could also work to help womens rights by providing help and training. With more than 7,100 islands, the Philippines is a sprawling country with a rich history of biodiversity. However that biodiversity is slowly eroding due to, unfortunately, us. The Philippine coral reefs have been especially damaged, due to the increase in our population’s need for coastal development. Another big issue has been deforestation, where decades of this practice has left only 3% of the original forest cover left. Projects that need of volunteers include raisiing awareness of human environmental impact, protecting endangered coral cays and of course, in light of recent storms, humanitarian aid is greatly needed as well. There are also eco conservation projects where you can help the environmental where you can educational local communities and also help prevent deforestation which is a major problem in places like Romblon province. Tourism is also increasing every year which has a negative effect on nature and the environment, some organisations are running sustainable tourism and eco living projects to help long term. There are medical outreach clinics set up to provide healthcare to rural and disadvantaged communities - sometimes this is the only source of medical attention some people get. If you have any medical/healthcare experience your skills will be put to good use as there is often a lack of staff/resources. Tasks can include running medical check ups and helping provide advice and recommendations to local people on how to stay healthy. These programs are perfect if you are a medical student seeking experience in a developing nation but even if you don't have any formal training or experience you can still join but you will be placed on a general assistance role. Keen to help in the Philippines since the devestation of typhoon Haiyan. You can either donate to an internationally recognised organisation like the Disasters Emergency Committee who are providing much needed help on the ground with experienced staff or apply to join a group building, construction and relief program. A lot of the organisations we work put a lot of their programs on hold since the disaster but are now focusing on recruiting new people. We work with some international volunteer sending agencies like Projects-Abroad who are currently offering placements including improving educational institutions and community building / renovation, you can view this placement and apply above. Please do not just book a flight to the Philippines and expect to be able to travel to affected areas and be able to make a difference, this might do more harm than good. 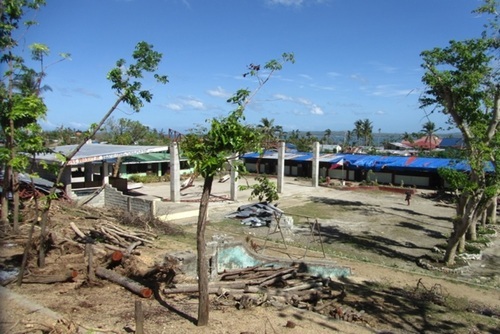 The area of the country hit by typhoon Haiyan is really devestated and it is best to leave the main relief efforts to well established organisations and experienced skilled staff. Teachers are needed to participate on programs in the Philippines, there are a lack of educational resources and also teachers and there are lots of openings all year round to work in the country. You could help lead lessons in English, maths, science or computing helping local teachers. These positions are closed during the summer months due to the school holidays. To get a paid volunteer position you will need to take a TEFL qualification. There are also community placements at youth centers, coaching sports like football and basketball and also orphanage roles which care for the most disadvantaged children in the country. You will usually be working alongside locally employed staff (the fee you pay to join helps provide jobs in country for Philippino people) and work alongside other international participants from all over the world. It is hard to say how many people will be on each project as this depends on the time of year and also the placement. Usually you will work around 5 days per week for 6 hours per day - this can vary though and the routine can change daily. Please note some facilities and amenities might not be to the high standard you are used to but don't let this put you off - shared accommodation is usually provided but for an extra fee you can go private. Placements are usually challenging and rewarding when you will get to see the difference you can make. Some local organisations only let people who are aged 18 and over volunteer but each placement is different so please research each opportunity. You will need to be eligible for a tourist visa to apply, no knowledge of the language is required as most people speak English in the Philippines. A positive and flexible attitude is also required. You will need a valid passport to enter the country and if you are joining a project for 3 weeks or less you will not need to apply for a visa in advance, you can just arrive and be granted one on arrival. If you plan to stay longer you will need to obtain an extension which is fairly easy to do. The Philippines is generally a very safe destination where locals are likely to greet you with smiles rather than any danger but it's best to always keep your wits about you though and at night always try to either travel with others or let people know where you are going. Problems like scams and pick-pocketing are more likely to occur in the larger cities rather than rural/touristy areas. You might want to check what vaccinations are needed prior to arrival, we recommend Yellow Fever which is required and also possibly rabies. Most programs in the Philippines come part of a structured program where you will need to pay an application fee to join. The price can depend on the project, organisation and location. Generally the fee includes placements, pre-departure support, 24-hour emergency phone support, airport pick-up, arrival orientation, accommodation, meals, training by experienced staff, project equipment and materials and First Aid & CPR training. Project fee usually excludes flights, medical and travel insurance and excursions. You can apply today through our website, most projects can be joined for a week to over a year depending on your availability and can be joined Monday of every week. There is no best time to apply but you might want to check season / weather reports before handing in your application.